TREAT's 35th Annual General Meeting will be held on Friday 1st September at the Yungaburra Community Hall commencing at 7.30pm. Annual reports by the President, Treasurer and Nursery Manager will be followed by the election of TREAT office bearers for the next year. Members are reminded that they must be financial when voting for the new committee. Subscriptions will be accepted at the AGM. Our guest speaker for the evening will be Dr. Amanda Freeman who will present a talk on 'How useful is revegetation for Wet Tropics rainforest birds? (and how useful are the birds for revegetation?)'. Amanda is Centre Director of The School for Field Studies, Centre for Rainforest Studies, and an Adjunct Research Fellow at Griffith University. Amanda's research interests include the ecological values of revegetation, particularly for birds, and how landscape context influences re-colonisation of rainforest restoration sites by fauna. She has been studying birds in rainforest revegetation on the Atherton Tablelands on and off since the late 1990s. A general meeting follows the AGM and the evening concludes with a supper. Plate contributions are appreciated. Everyone is welcome to attend. Living in the Wet Tropics, we benefit from the experience of a number of practitioners who have spent decades replanting rainforest specifically for the purpose of restoring ecological values. 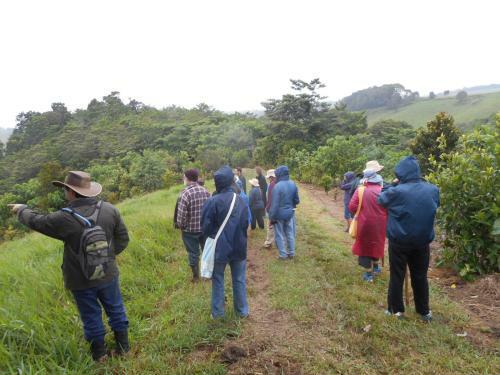 These people have the advantage of having worked across many different sites, over a number of different years and of being able to observe over time the outcomes of using different methods to replant rainforest. In 'Repairing the Rainforest', Steve Goosem and Nigel Tucker1 document the overarching methodology for restoring rainforest in the region, informing restoration practice in other regions of Australia and the world. However, the full suite of detailed replanting methods from go to whoa had not been documented in ways that most people could easily access (often it's in people's heads). It was observed that setting down the replanting knowledge held among practitioners would make it easier to pass on knowledge, weigh alternative approaches, work out the lifetime costs of using different methods, and identify where research could make further important contributions to restoration practice. 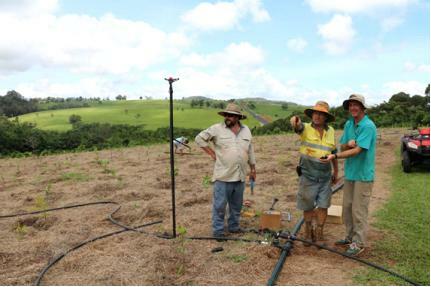 Supported by a Community grant from Terrain NRM, TREAT initiated a project aimed at recording the detailed methods used by experienced practitioners to replant rainforest, together with the reasons why certain methods are chosen, and their research priorities. 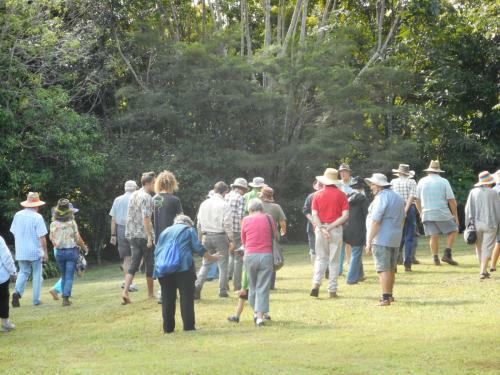 Over 15 practitioners from the upland Wet Tropics were involved in one-on-one conversations and/or a full-day workshop held at CSIRO in Atherton. A small number of researchers and NRM co-ordinators were also involved in the project. 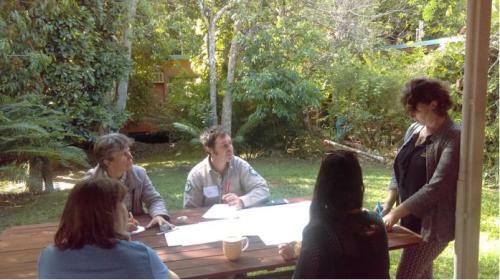 One of the small group discussions held during the workshop in Atherton with restoration practitioners. A lot of information was collected during this process and this was published in a written report in April this year, available electronically (download here) from TREAT. 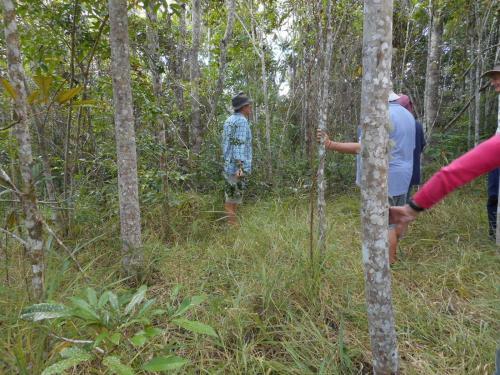 There is a lot of agreement among experienced practitioners in terms of the suite of methods that work well for replanting rainforest in this region. The specific methods used by practitioners depend mostly on the conditions at a particular site, as well as access to funding, labour and other resources. Methods used by practitioners seek to minimise costs and have lasting ecological value. There are certain methods that practitioners use because they are thought to influence the development of the planting for decades after work has finished on the site. Practitioners support research into issues that will help choose between on-ground methods and are willing to participate in field trials addressing these questions. 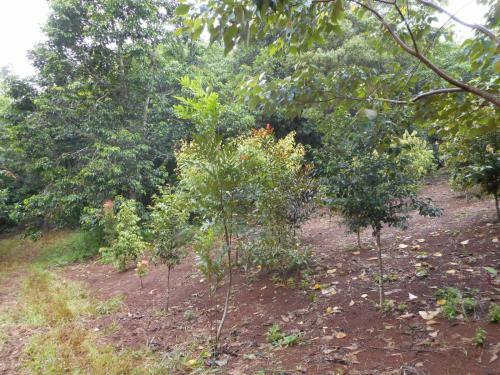 This project dealt with methods used for plantings over 1 hectare in size because this is a spatial scale at which efficiencies are critical to the practicality of planting. For smaller plantings, it may be practical to use methods that are usually too costly or time consuming for larger works. Also, this project focused on planting done with the intention of restoring ecological values, and did not include methods for planting carried out primarily to provide a certain environmental service, such as timber production, stream bank stabilisation, or carbon sequestration. While these other types of plantings can also increase ecological values (and more readily provide economic returns at this stage), research has shown that ecological restoration plantings have higher value for biodiversity at the time scale of a couple of decades2. There is concern that ecological values need to be restored as quickly as possible because of the immediate need to increase the amount of habitat available, as well as the connectivity between habitats for species and systems that are currently of conservation concern. Of course, the substantial and rapid changes being driven by climate change also make it important to seek ways of quickly and effectively restoring natural systems. Finally, while the focus of ecological plantings is on biodiversity, they can also have other benefits in terms of stabilising soil, controlling runoff and sequestering carbon. Canopy of a four year-old ecological restoration planting at Ringtail Crossing. Since the 1990s when it became more common to do large-scale planting for the specific purpose of restoring complex rainforest systems, practitioners and researchers have been watching how different plantings have gone over time. There is strong agreement that in the Wet Tropics region, aggressive pasture grasses will rapidly reinvade a planted site if they are not kept under control. Without control of grasses, hundreds of planted rainforest seedlings can remain stunted beneath blankets of grass, may slowly grow up surrounded by grasses, or eventually die through lack of access to sunlight, nutrients or moisture. These outcomes are not a good return on the investment of resources in the initial planting, and probably make little contribution to conservation, especially in the near future. In addition to managing the threat from grasses, there is widespread agreement on a broad approach to planting rainforest. This approach takes the form of an intense, 3 to 4 year 'active phase' when the vast majority of work done on a planting site happens. By the end of the active phase, the site needs to be at a point where pasture grasses are not likely to reinvade and smother planted seedlings. 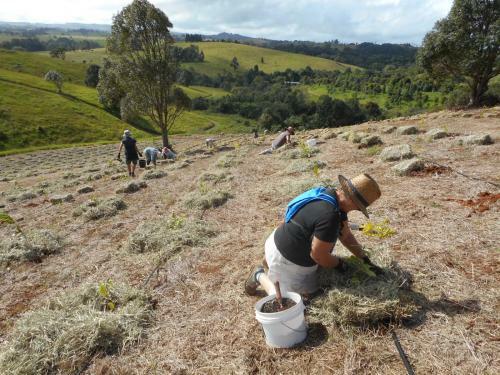 Pasture grasses don't thrive in shady conditions, so practitioners aim to establish a closed rainforest sapling within 3 - 4 years of planting, as well as depleting the amount of grass seed in the soil through repeated control during the active phase. The on-ground methods considered to be especially important in achieving this include: planting stems fairly close together (i.e., between 1.5 and 2m apart), selecting certain combinations of plant species including those that survive in the open and grow fast, and by diligently and repeatedly controlling aggressive pasture grasses and other weeds during the active phase. 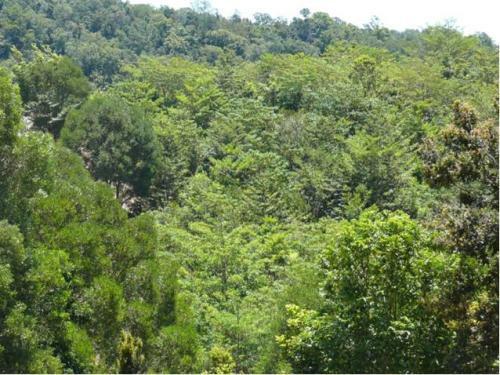 To achieve canopy closure within a few years, it's also critical to maximise the survival and growth of planted seedlings, and the following are considered to be important to this end: suitable preparation of the planting bed, planting during the wet season, careful planting of seedlings, the use of healthy seedlings, the selection of appropriate species for the location and site conditions, as well as providing moisture, fertiliser, mulch and so on. It's much more complicated than simply sticking stems in the ground. 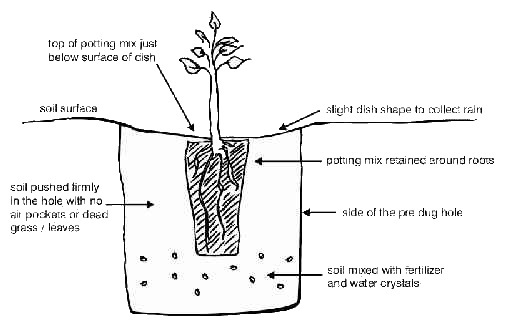 Illustration of key planting steps to maximize survival of seedlings at planting. In the case of ecological restoration, the ultimate goal of replanting is to achieve something that resembles a natural rainforest system. However, no-one expects a planting to look or work like a complex rainforest for decades - possibly centuries - after the active phase has finished. The transformation from an even-aged planting to a forest system with mature trees, saplings, ferns, vines, epiphytes, diverse communities of animals and invertebrates will depend on a range of natural processes. For example, colonisation of replanted areas by invertebrates will enable decomposition and nutrient cycling, seed dispersal by birds and bats will create opportunities for new plant species to grow among planted trees, and pollination will permit planted trees to reproduce. The work done in the active phase of replanting creates the template for what will happen in the future and certain specific methods are chosen based on an understanding of the processes that will transform replanted sites into more complex rainforest systems. For example, practitioners typically include a suite of fleshy-fruited plant species in plantings to encourage birds and bats to feed in the site as a way of promoting the dispersal of seeds from a wider range of plants. Removing grasses controls competition with rainforest seeds, and establishing a closed canopy promotes shaded, moist conditions that suit the germination of typical rainforest plant species. 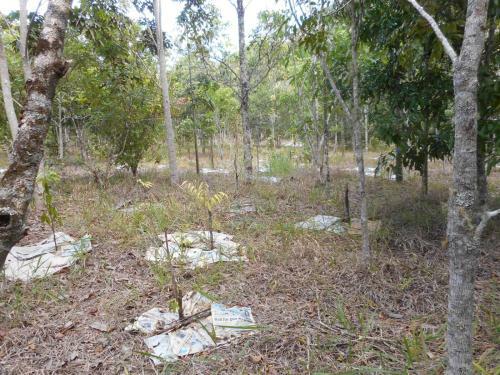 Knowledge about these processes comes from studies of forest regeneration after natural disturbances (e.g., cyclones), in the patches of forest left after land clearing, and in replanted sites. However, since ecological replanting has only become common in the last 40 years, it's not possible to say which methods most strongly influence how closely a replanted site will eventually resemble a rainforest system in terms of the species it contains and the ways it functions, nor how long this takes. Research has shown that after 2 decades, ecological plantings in the Wet Tropics are developing towards rainforest but are usually still lacking in some diversity. Developing this understanding over time will be up to the next generations of tree planters and researchers. Ask any restoration practitioner to describe the 'best' method to replant rainforest and they will usually tell you: “It depends on where you are”. 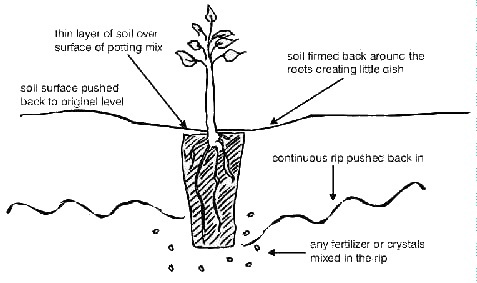 For example, the method chosen to prepare the planting bed can depend on the type of soil at a site; ripping can create a good planting bed and be time and cost efficient, especially in alluvial soils, whereas drilling holes with an auger or using hand tools may be more successful in heavier soils. In the Wet Tropics, practitioners usually plant a high diversity of native species (between 60 and 100) in ecological plantings. This is one of the key differences between ecological replanting and other types of planting (e.g., timber plantings). However, where a site is located up against natural rainforest, practitioners may use many fewer species (e.g., 30), including a high proportion of those that grow quickly and fruit early, and depend on natural seed input from birds and bats to rapidly increase plant diversity in the replanting. Planting along watercourses requires a different approach again. Much of the thinking behind this is set out in 'Repairing the Rainforest' and the full report from this project provides detailed explanation of the ways that different site characteristics, as well as weather conditions and the availability of funding and other resources can affect the specific methods used. The detailed knowledge documented in the report has arisen mostly from a process of 'intelligent tinkering' by practitioners, whereby certain methods are tried, results observed over time and practice adapted accordingly. It has been rare for alternative methods to be tried at the same time under different conditions in order to systematically compare any differences in outcomes. Accordingly, much of the rationale supporting practitioners' choice of methods is based on their experience, observation and logic. However, practitioners have identified some cases where systematic comparison of different planting methods could help practitioners to improve practice and potentially reduce costs. Of course, there is considerable interest to know how certain planting methods relate to longer-term ecological outcomes. For example, practitioners want to know how the dispersal and recruitment of native rainforest plants after the active phase is related to the selection of species in the initial planting, including any influence of the proportion of fast-growing species and the diversity of plant species used. As the control of grasses and weeds can account for such a large proportion of the work involved in planting, this is an area where there are several unresolved issues. For example, depending on the type of grass on a planting site (e.g., guinea grass is more aggressive than para and molasses grasses), grasses might be sprayed with herbicide 3-6 times in the first year after planting, 2-4 times in the second year and once or twice in the 3rd and 4th years. But there is ongoing discussion among practitioners about whether or not different outcomes are achieved, and different lifetime costs incurred, if grass control is scheduled differently, for example spread more evenly across years. There is also pervasive concern among practitioners about the potential environmental and health effects of using chemical herbicides. 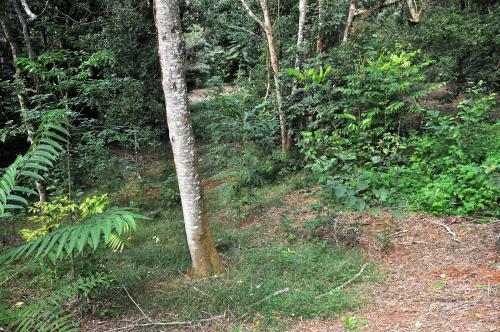 Of course, direct planting is not the only way to restore rainforest cover on cleared land. For example, many hectares of regrowth have naturally come up in areas that were cleared. Although these areas are typically quite weedy, they can provide habitat for a surprising variety of native rainforest plants and animals. There's a range of interesting discussion to be had about the role of natural regrowth in rainforest restoration - you might have read or heard about the innovative work being led by Carla Catterall at Cloudland and Ringtail Crossing. But that's another story.. It's important to acknowledge the following people who contributed their knowledge and ideas to this work through participation in interviews, the workshop and other related discussions: Mark McCaffrey, Angela McCaffrey, Kylie Freebody, Peter Snodgrass, Sylvia Conway, Geoff Onus, Alison King, Larry Crook , Cathy Retter, Nigel Tucker, Simon Burchill, Carla Catterall, Campbell Clarke, Dave Hudson, Barbara Lanskey, Caleb Zaicz, Andrew Lilley, Jax Bergersen, Keith Smith, Evizel Seymour and Ian Sinclair. Catterall, C.P., Kanowski, J. and Wardell-Johnson, G.W. (2008) Biodiversity and new forests: interacting processes, prospects and pitfalls of rainforest restoration. In N. Stork and S. Turton (Eds) in Living in a dynamic tropical forest landscape. Wiley Press, Oxford. TREAT held only two field days this year, the first at Peter and Trixie Tuck's property at Yungaburra and the second at Mark and Angela McCaffrey's property past Tarzali. Over 30 people came to the first day and the weather was balmy, but the second day saw only about 20 people brave the wet drizzly conditions, which actually eased for the afternoon. This field day happened because I couldn't quite believe Peter was having problems with grass invading his tree plantings done in 2008. They had been appropriately maintained for the initial years. On visiting, I thought others would be interested to see what can happen with aggressive grasses in competition with trees. I was delighted with the attendance on the day and the walk around was most instructive. Peter and Trixie started planting trees in 1993 to screen the road and to add to existing trees along Peterson Creek. These trees are now mature with some typical understorey growth. The continued plantings near the creek did well and we walked through these, noticing the leaf litter and seedling recruitment. However, when we came to the 2008 plantings, there was a marked difference. The canopy was sparse and Brachiaria grass was growing underneath. A large patch of this grass was left where they had intended to build some holiday cottages and the grass was growing exceptionally well there. Since selling their tourism adventure business, Peter and Trixie now have some time to revisit their plantings. They are spraying the grass beneath the trees and in some areas laying down cardboard to plant infills which they are fertilising and watering. The infills may struggle to grow with root competition from the older trees, but the attention to the grass will help the existing trees as well as the infills. It was observed that many of the trees lacked leafy lower branches which would have assisted with shade cover to hinder the grass growth. In patches where the trees did have leafy lower branches the trees were growing much better. In a newer screen planting near the road, the lower growth of these trees had out-competed the grass. These trees were also planted more closely than the 2008 trees. The end of the walk was to an area where a former fence marked the boundary of cropping in previous years. The trees which were planted on either side are of the same age, but on the northern side there is no grass, more shade and seedling recruitment under the trees, while on the southern side the trees are still struggling with some grass. Peter surmised that the more vigorous growth on the uncropped northern side may have been due to more soil nitrogen resulting from a lot of Tinaroo Glycine there before planting. While Peter led the walk, Trixie made delicious sandwiches and slice and set up afternoon tea for us in the garden. We gradually drifted away afterwards, with the youngest trio (who were new to our field days) staying till the end. This field day was part of a funding requirement, but a golden opportunity for people to check out what can be achieved with commitment, enthusiasm and some funding, over a relatively short period of a dozen years or so. I was pleasantly surprised to see many attend who had helped with the plantings over the years, and was particularly pleased to see the younger people who attended the previous field day, come to this one as well. Angela and Mark both took us on a walk which started by going through some plantings near their shed, then through a regrowth area, along the main access track to a small remnant, down through some plantings near the remnant, back up the hill to the access track, then back to the shed for afternoon tea. Mark and Angela now give advice at TREAT workshops on site preparation, planting and maintenance, and their particular dedication to getting rid of competing weeds was evident in our progress through the plantings. The trees are planted 1.5 - 1.8 m apart and this spacing helps create a canopy when the trees are quite young, reducing the need for maintenance. At one point we looked down to the 2014 planting where Mark was able to walk away from maintenance after only 2 years. It showed tremendous growth with full canopy closure. We remembered it as a planting which was done in very wet conditions, no doubt assisting with the subsequent growth. Angela has done a lot of weed control in the Acacia regrowth areas, particularly near the first part of the main access track. The weeds are kept sprayed and seedling recruits are often marked with a small stake while very young to avoid inadvertently spraying them or walking on them. Some of the rainforest grass (Oplismenus undulatifolius) has appeared and that is left as part of the forest habitat. While some trees coming up are fast growing, they take a long time to grow large under the Acacias due to root competition and light. Also, many seedlings are predated by pademelons and turkeys. To assist in the regeneration, seeds of some species are broadcast and seeds of others buried, but often without success. All the planted and regrowth areas were once a mass of lantana and pasture grasses. A lot of effort has gone into getting rid of these weeds, but a few areas of grass have been left (without the lantana) as habitat to encourage the Blue-faced Parrot-Finch, as small flocks of these occasionally come to the property. At the remnant, we walked into the first small planting done in 2004, to look at scratch marks on trees. We saw them on various trees down the hill, indicating their use by possums and tree-kangaroos. Back at the shed for afternoon tea, the sandwiches and cakes quickly disappeared. Ann had come to put the kettle on to boil and she told of a lass she'd met on Turner Road who wanted to come to the field day. She apparently walked to the first creek then thankfully decided to return to her car. She needed to cross another 2 creeks to get to the field day! She missed a great afternoon. Peter and Trixie Tuck's property. Mark and Angela McCaffrey's property. 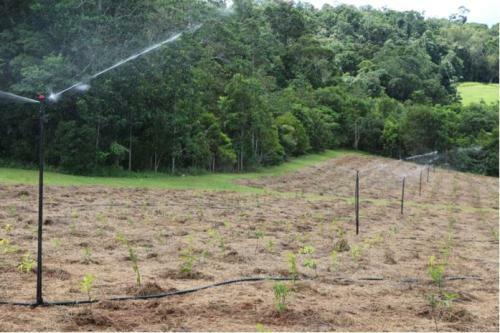 The concept of spray and release has long been recognised by the conservation community as an alternative to revegetating rainforest by planting. The idea is that costs and workloads can be reduced enormously in locations where the edge of an existing remnant of forest, small clump of trees or patch of regrowth can be encouraged to spread into adjacent ground by controlling weeds and allowing native seedlings to grow and extend the area under forest. Grasses and woody weeds such as Lantana have a negative effect on the edges of forest and out-compete native seedlings for light, moisture and nutrients, therefore restricting the edges from expanding. Mark and I were keen to give this a go when we first applied for our Biodiversity Funding from the federal government as we had around four hectares of weedy areas under Acacia celsa regrowth. That was back in 2011 and having worked on this process for five years (2012 - 2017) it's now a good time to reflect on how well it has worked, how the costs compare and how we evolved it over this period. We had in fact already started the process back in 2006 tackling large patches of Lantana and Guinea Grass by hand, bashing it down to the ground and spraying the clumps of new leaves when they regrew. We carefully worked around as many native seedlings as possible, even though they were often weak and whippy. It was slow and hard work which became low priority as we battled with weed control in our planted areas and especially after Cyclone Larry made a mess of much of the regrowth. In our funding agreement we had agreed to take on the task of weed control by starting with about 1ha and adding another hectare each year until all four hectares would have varying stages of weed control, and seedlings would be enhanced by adding extra seed from native fruit collected from trees in our area. This would happen alongside the planting of another four hectares and the maintenance of four hectares previously planted. The success of the planted areas is well documented but little has been said about the progress made in the non-planted areas. After initial removal of Lantana, grasses and other weeds, there were large amounts of mulch including plenty of woody material to keep the soil moist. However within a short space of time the weeds typically found in revegetation such as blue top (Ageratum conyzoides) become prolific and spraying becomes difficult and intensive. In planted areas spraying weeds is easier because the seedlings are more advanced and at regular intervals in lines, whereas in non-planted areas the seedlings are generally tiny and randomly dispersed in the shadier edges, so concentrating is the key to avoiding them. This makes spraying slower and therefore more costly. This only increases as the mulch disappears and seedlings of varying sizes appear throughout the site along with constant waves of weed seedlings. When we started this task we had unrealistic expectations. The idea that one could throw seed of different species around and the seedlings would pop up and grow strongly is tempting but it simply doesn't work like that. If you think about germination in the nursery where we clean the seed, spread it on an ideal mix, cover it in scoria, provide just the right amount of light and regular moisture, it's no wonder we get great results. In the areas of regrowth it is impossible to control many of these aspects. Cleaned seed becomes too dry so leaving the flesh on can be an advantage but it also attracts predators, leaving the seed on the surface. Burying each seed in the mulch seems reasonable but this is terribly time consuming and again it becomes food for the turkeys which actually started following me around. Choosing rainy periods seems obvious but it's amazing how quickly it becomes dry once the showers stop, and we are trying to fit these tasks in at times when we are not planting or maintaining planted trees. Having reached the stage where several seeds have germinated, probably in winter when there is drizzle and less intense sunny periods, we then move on to spring when the showers dry up and so do the seedlings. Many don't make it beyond that first season and this includes the ones which have been deposited naturally by birds, bats and wind and which are in much greater numbers than the ones we have managed to coax into life. It became clear after the first couple of years that only the seeds deposited in the margins stand a chance, and so our seed distribution concentrates in these areas. Each seed is now covered in soil at times when I have escaped the attention of the turkeys and so more seedlings come through but then there is the challenge of shade. Where is there enough shade to protect the seed from drying out but not where it is so dense that the germinated seedling sits in a state of suspended animation as many do on the forest floor waiting for a gap in the canopy? The margins of ideal light and moisture are actually very small and once you factor in the fact that the trees on the edges are also responding to being released from weeds and growing well, the margins can disappear in the time it takes for a seedling to reach a less vulnerable size. Back to the nursery scenario, the seedlings we plant have on average spent up to a year in the seed tray and around 18 months in the tube after potting, so when we plant them out they are often at least two years old in perfect conditions. In the field the ideal spots are constantly changing, so the size of seedlings after two years in the ground is nowhere near the size in the nursery. I have watched precious seedlings come through three years of growth with little cages of dead branches and mulch built up around them to help create a micro climate and keep casual browsers at bay, only to have them disappear with a particularly dry spell or a more enthusiastic predator taking them out in one chomp. It can be quite emotional to see these baby trees survive against the odds and then disappear. It has not been the easy task we imagined when we first decided to try this, nor have we had anything like the results expected in five years but I have to say that, when you look closely, this last year has seen much improvement in these areas. I'm actually quite proud of the way these areas look now compared with five years ago. One factor I have not discussed is the cost and this is one of the benefits often cited when this type of work is suggested. I am not able to quantify the cost of our little experiment but I know that it has taken a huge number of volunteer hours, first getting the weeds under control then keeping them at bay, distributing seed, protecting and monitoring the progress or lack thereof of the seedlings, on top of the small amount of funded work. I can't say definitively but I'd guess the results would not be good value for money if it was all paid labour. The cost of planted areas is fairly well known as being between $25,000 and $50,000 per hectare depending on seedling density, site conditions and the amount of maintenance provided, but at least one can generally be sure of the kind of results expected. It will be several more years and a lot more hours spraying weeds before we have a similar look in the spray and release area to that of a planted area after three years. At least we have well fed turkeys. 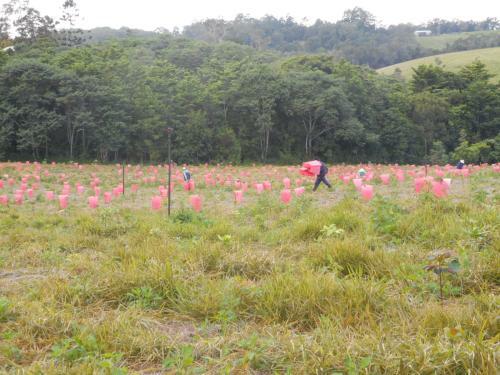 This planting of 1300 trees on Lindsay Jorgensen's property at Jaggan eventually took place on 13th May. About 20 volunteers had fine and cool weather for planting, but it wasn't an easy planting. Mike and Lindsay had prepared the site well and put out plenty of small bales of mulch. They had also set up drip irrigation from a tank on the ridge. Due to the slope of the land, digging the holes with machinery could only be safely done when it wasn't too wet and this opportunity came at the beginning of the week. Unfortunately there was no rain afterwards and the sun dried out the top of the holes. Those who were planting at the top of the site had the driest holes and extra time was taken to dig out damp soil from the lower sides of the holes to put around the root ball of each newly planted tree. As drip irrigation was set up, no water crystals were necessary, but we did add fertiliser to the holes and mulched as we planted. With fewer volunteers than usual, the planting took longer but was still finished about 11am. The barbecue was set up in a nearby shed and there was a shower of rain before we left, so we hope the trees all survived their planting. TREAT re-uses the frost guards that we bought with funding some years ago. They have proved very effective and with winter upon us, it was time to use them again. On the Friday mornings of 9th and 16th June, a dozen or so volunteers came early to Ian's place (Freeman Forest) on Peterson Creek to put them around the vulnerable trees planted in March and April. Some tree species are more susceptible to frost than others, and trees at the bottom of a slope suffer the most. With practice and teamwork, a lot of guards were put on in a seemingly very short time and then we were off to the nursery for morning tea. The guards will stay on the small trees till the danger of frost is over, but then they need to be removed before the weather gets too hot. With more nearby trees helping to protect the young planted trees, fewer guards are needed each year. With the planting season nearly over and the dedicated pot washers putting the last of the pots through the sterilisers, preparations are once again underway for next planting season. Potting of next season's stock is well advanced and with the mild winter so far, the seedlings are thriving with no noticeable slowing in growth. Project plans are in progress and the annual nursery stocktake is about to commence so that we can fine tune our potting requirements over the next few months for the upcoming planting season, as well as capturing some data for our annual report. Seed collections are starting to pick up again after a lull. Some species which flowered well earlier in the year failed to produce a crop, most likely due to the week-long blast of very warm, westerly winds following Tropical Cyclone Debbie crossing the central Queensland coast in late March. Acronychia acidula (Lemon Aspen) was particularly affected with very few trees producing fruit - I managed to locate only one tree with fruit during seed collection rounds. I suspect southern tableland cassowaries have been having a tough time as this species is a staple part of their diet at this time of year. Trees planted at the QPWS Massey Creek community planting in February this year are establishing nicely, experiencing only light frost over a short period in early June. Weed control and fertilising of this and the adjacent 2016 planting was undertaken in June by Lake Eacham QPWS staff. New staff member Stuart Russell received permanent appointment to Lake Eacham QPWS staff in April and together with Simon Brown, will be part of the rotation of staff between the nursery and the Lake Eacham Management Unit. Staff rotation is now at 9 monthly intervals and for those staff involved this should give them a decent overlap of the wide variety of seasonal work undertaken by both work units.